"Unapologetic work of a data parasite" incorporates writings and drawings collected by the artist at the Broad Institute of MIT and Harvard while she was the Artist in Residence in 2016. The artist devoted much of her time exploring the Institute during the first few months of her residency period. She walked every floor and tried to visit, or at least peek into every lab. She did a tour with Facilities staff to see behind-the-scenes areas including boiler and mechanical rooms, cooling towers, steam engines, water treatment systems and much more. She visited the sequencing lab on Charles Street, and met with many scientists. But it was during the quiet evenings at the Institute when she was making her “rounds” alone, when she was often struck by the writings and drawings left on the whiteboards by scientists all around the Institute. 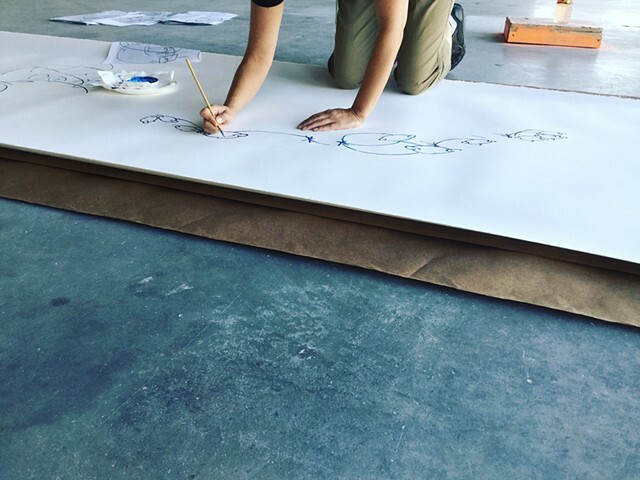 The artist found them intriguing, felt the energy of the creators from these marks, and soon she started tracing them on vellum papers without knowing exactly what she would do with them. She continued her quiet activities mostly in the evenings and weekends. In her mind, she was “preserving” this data. In fact, these whiteboards get erased once a week at Broad Institute. The writings were ephemeral—ideas and thoughts disappearing as quickly as they were poured out onto the whiteboard. The artist began to regard her activities as data gathering. Later, the artist started assembling her tracings in several layers, and found the resulting complex imagery fascinating. The density of the marks created by the layering of several sheets of vellum paper made her think of the magnitudes of cumulative data. But as she added more, the originals became less legible. Lines, shapes, and words came to exist as a part of a larger complex system. Incommunicability of the scientific writings, formulas and notations that she felt as lay person was now visually forming in front of her eyes. “Reading” these notations and formulas was impossible for her, nonetheless, she felt the depth of energy, and a fundamental desire for knowledge and exploration. "Unapologetic work of a data parasite" was created by re-tracing and composing the marks that the artist collected from the whiteboards. It was composed in a flow, following the energy that the artist felt from the original marks.